Between 1 April and 30 June 2016, Mapping Media Freedom’s network of 18 correspondents and other journalists submitted a total of 341 violations of press freedom to the database, a 13% rise over the first quarter of 2016. “Journalists are beaten, intimidated, imprisoned and killed in the pursuit of telling a story, exposing the truth and informing the public. These courageous men and women are the vanguard for free speech, freedom of expression and, ultimately, a free and democratic society. We need to come together and fight for journalists’ safety and end impunity for crimes committed against journalists,” said Dunja Mijatović, the OSCE Representative on Freedom of the Media. The report is available now at https://mappingmediafreedom.org/plus/ or as a PDF. 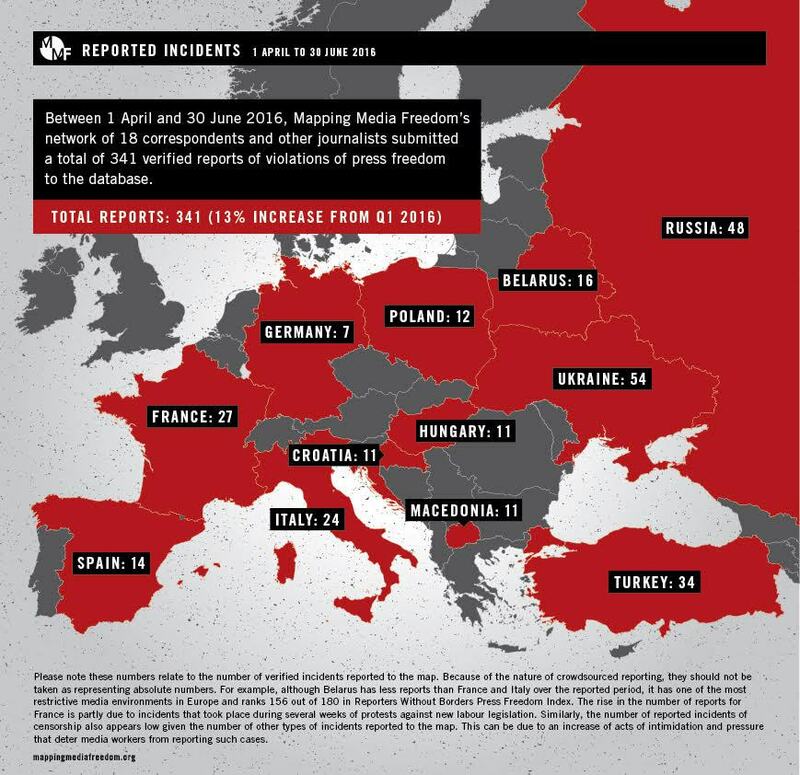 Mapping Media Freedom – a joint undertaking with the European Federation of Journalists and Reporters Without Borders and partially funded by the European Commission – covers 42 countries with a network of correspondents, including all EU member states, plus Albania, Azerbaijan, Belarus, Bosnia, Iceland, Kosovo, Macedonia, Montenegro, Norway, Russia, Serbia, Turkey, Ukraine and Vatican City. In September 2015 the platform expanded to monitor Russia, Ukraine and Belarus and in February 2016 into Azerbaijan. Each report is fact checked with local sources before becoming available on the interactive map. Since launching in May 2014, the map has recorded over 2,000 incidents threatening media freedom.